To commemorate October as American Archive Month, six new images have been released from the Chandra Data Archive. The archive houses the data from Chandra’s observations, making them available for ongoing and future studies. The objects are: (top row, l-r) W44, a supernova remnant; SN 1987A, the remnant of a bright nearby supernova; Kes 79, a super nova remnant; (bottom row, l-r) MS 0735.6+7421, an erupting galaxy cluster; 3C295, a galaxy cluster within a superheated gas cloud; the Guitar Nebula, a pulsar. Further details about these images and objects, and many more, may be found on the Chandra website. Three orbiting X-ray space telescopes have detected an increased rate of X-ray flares from the usually quiet giant black hole at the center of our Milky Way galaxy after new long-term monitoring. Scientists are trying to learn whether this is normal behavior that was unnoticed due to limited monitoring, or these flares are triggered by the recent close passage of a mysterious, dusty object. By combining information from long monitoring campaigns by NASA’s Chandra X-ray Observatory and ESA’s XMM-Newton, with observations by the Swift satellite, astronomers were able to carefully trace the activity of the Milky Way’s supermassive black hole over the last 15 years. The supermassive black hole, Sagittarius A*, weighs in at slightly more than 4 million times the mass of the Sun. X-rays are produced by hot gas flowing toward the black hole. Originally, astronomers thought G2 was an extended cloud of gas and dust. However, after passing close to Sgr A* in late 2013, its appearance did not change much, apart from being slightly stretched by the gravity of the black hole. This led to new theories that G2 was not simply a gas cloud, but instead a star swathed in an extended dusty cocoon. While the timing of G2’s passage with the surge in X-rays from Sgr A* is intriguing astronomers see other black holes that seem to behave like Sgr A*. Therefore, it’s possible this increased chatter from Sgr A* may be a common trait among black holes and unrelated to G2. For example, the increased X-ray activity could be due to a change in the strength of winds from nearby massive stars that are feeding material to the black hole. If the G2 explanation is correct, the spike in bright X-ray flares would be the first sign of excess material falling onto the black hole because of the cloud’s close passage. Some gas would likely have been stripped off the cloud, and captured by the gravity of Sgr A*. It then could have started interacting with hot material flowing towards the black hole, funneling more gas toward the black hole that could later be consumed by Sgr A*. Links: Full Chandra press release; detailed image description; MNRAS paper by G. Ponti et al. 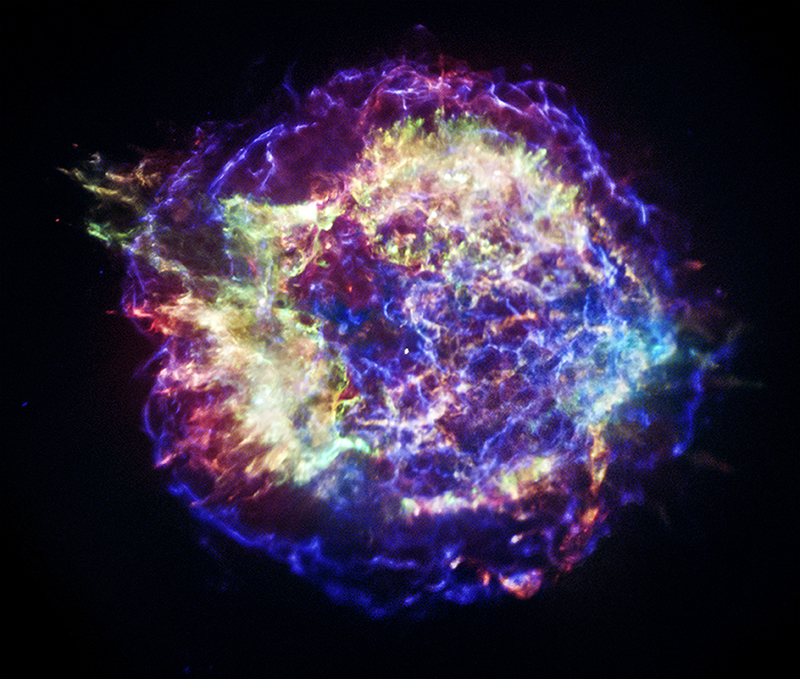 One of the most famous objects in the sky, the Cassiopeia A supernova remnant (see Figure 13-18c) – Cas A, for short – has been rendered for display like never before, thanks to NASA’s Chandra X-ray Observatory and a new project from the Smithsonian Institution. A new three-dimensional viewer allows users to interact with many one-of-a-kind objects from the Smithsonian as part of a large-scale effort to digitize many of the Institutions objects and artifacts. Scientists have combined data from Chandra, NASA’s Spitzer Space Telescope, and ground-based facilities to construct a unique 3D model of the 300-year old remains of a stellar explosion that blew a massive star apart, sending the stellar debris rushing into space at millions of miles per hour. The collaboration with this new Smithsonian 3D project allows the astronomical data collected on Cas A to be featured and highlighted in an open-access program. To coincide with Cas A being featured in this new 3D effort, a specially-processed version of Chandra’s data of this supernova remnant has been released. This new image shows with better clarity the appearance of Cas A in different energy bands, which will aid astronomers in their efforts to reconstruct details of the supernova process such as the size of the star, its chemical makeup, and the explosion mechanism. 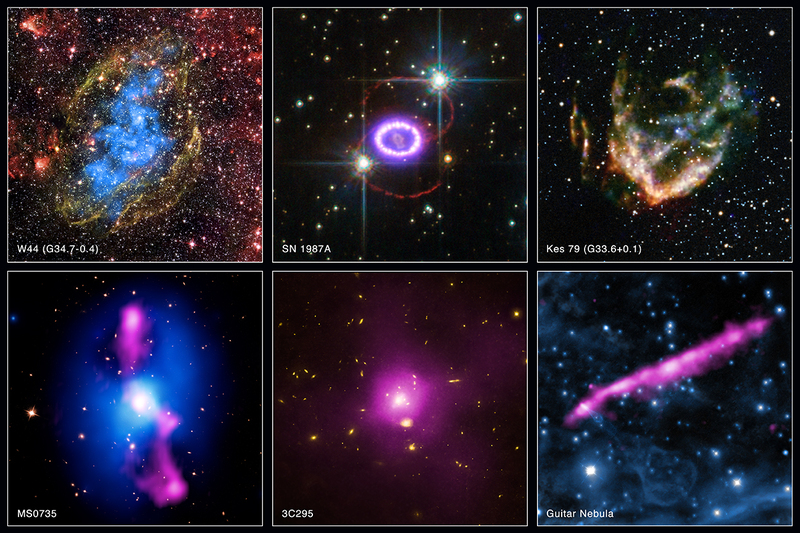 The color scheme used in this image is the following: low-energy X-rays are red, medium-energy ones are green, and the highest-energy X-rays detected by Chandra are colored blue. Cas A is the only astronomical object to be featured in the new Smithsonian 3D project. This and other objects in the collection – which include the Wright brothers plane, a 1600-year-old stone Buddha, a gunboat from the Revolutionary War, and fossil whales from Chile – were showcased in the Smithsonian X 3D event on November 13th and 14th at the Smithsonian in Washington, DC. Links: Smithsonian X 3D beta tour; Chandra X-ray Center press release; NASA press release; YouTube movie of a fly-through.